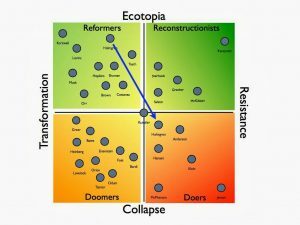 Since the publication, David Holmgren’s essay “Crash on Demand” has generated a heated debate among the sustainability communities around the world. We try to keep up with the discussion in the cyber world as much as possible (but if we missed any other articles and blogposts, please let us know). Below, we compile the list of articles and posts we have come across (so far) all worth reading, including most of the comments (last updated on May 15, 2015). υγεία (mediterranean food) Permaculture, also on the grokking eagle. Silvia Di Blasio (Mainstream Permaculture) Teaching permaculture: what is permaculture for. David Pllard (how to save the world) How our narratives inform our hopes for change also on Resilience.org. Mary Logan (A prosperous way down) Fitting into nature–or not (see comments). The Overthinker The best way to address climate chane is NOT to talk about it. Norris Thomlinson (Farmer Scrub’s blog) Demand Crash! – a response to Holmgren’s “Crash on Demand”. Chris McLeod Let’s talk about collapse. Silvia Di Blasio (Living As If Others Really Mattered) Emphasizing the wrong “E”, Follow up on COD, and why it is worth continuing the discussion. Dimitry Orlov (ClubOrlov) David Holmgren’s Crash on Demand also on Resilience.org. John Michael Greer (The Archdruid Report) A bargain with the Archdruid also on Resilience.org. Kevin O’Conner (C-Realm) Dirty Pool: A Response to Guy McPherson. Joanne Poyourow (on Transition US) Economic descent, hopefully with skillful means also on Resilience.org. and Collapse? Maybe not also on Resilience.org. Erik Lindberg (Transition Milwaukee) Agency on Demand? Holmgren, Hopkins and the historical problem of agency also on Resilience.org. Rob Hopkins (Transition Culture) Holmgren’s “Crash on Demand”: be careful what you wish for also on Resilience.org. His more recent piece Reflections on being a “cultural optimist” and a month of scaling up also on Resilience.org. Jason Heppenstall (22 billion energy slaves) Stabbing the beast also on Resilience.org. David MacLeod (Integral Permaculture) Crash on Demand: David Holmgren updates his future scenarios also on Resilience.org. His later piece What is David Holmgren really telling us also on Resilience.org. His latest post David Holmgren: “I haven’t really changed my message” also on Resilience.org. Nicole Foss (the Automatic Earth) Crash on Demand? A response to David Holmgren. Albert Bates (the Great Change) Charting Collapseniks also on Resilience.org. Thanks Nicole, we will add it in the next post. The essay is getting translated into Spanish and Turkish, but, unfortunately, not into any other languages. If you are capable and are interested in translating this important essay, please get in touch with us. I’ve been pondering David’s proposed trigger for crash. Some of the push-back to the article has hinged on the statement ” I believe a radical change in the behaviour of a relatively small proportion of the global middle class could precipitate such a crash” with the suggestion that “10% of the population in affluent countries” was adequate to the task.